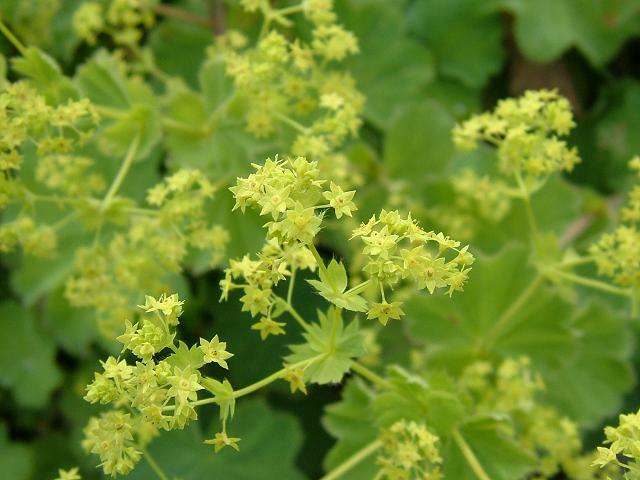 Lady's Mantle Alchemilla mollis, is a perennial herb native to Europe, north-west Asia, Greenland and north-eastern North America; it is also found in the Himalayas. It can be found growing in damp grassland, open woodland and on rock ledges. The Arabic word Alkemelych (alchemy) was thought to be one origin of its Latin name (because of its medicinal uses). An alternative explanation is related to the leaves of the herb, which came to the attention of those seeking the mystical properties of plants; their ability to hold teardrop-shaped droplets of dew in their folds gave the plants its Latin name of Alchemilla, meaning magical one. 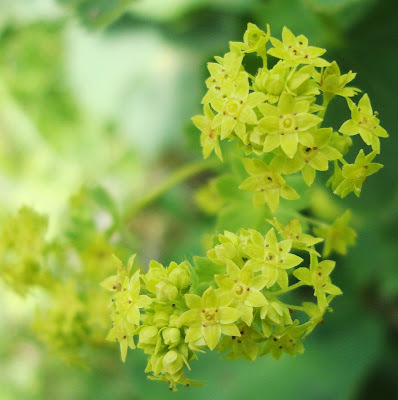 it's common name refers to the resemblance of the leaves to a lady's cloak (mantle) - a medieval observation. One folktale tells that placing a leaf of the herb under your pillow will induce a 'sweet slumber'. Traditionally, the plant has been used for obesity, and is now thought to aid in weight loss. The young leaves can be chopped up and added to salads or vegetables. Infused dried leaves are used as an astringent and facial steam for acne. Make a cold infusion to use for a compress on puffy eyes. Due to its tannic properties, it will produce a bright green dye for wool. Medicinally the plant is held in high esteem. It is known for its use in treating menstrual problems and for strengthening and healing after childbirth. Its pain relief qualities come from the action of the salicylic acid contained within the plant. Use dried leaves to prepare a mouthwash, or a poultice for healing wounds. To be avoided during pregnancy or when breast-feeding. 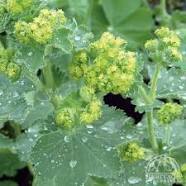 Fully hardy herb that grows almost anywhere except in waterlogged soil; does well in sun or partial shade. Can be grown from seed or division. Cut back hard after flowering to encourage new growth. Excellent edging and ground cover plant. Self-seeds freely and can become invasive. Lady's Mantle plant looks so great and one can grow this in their gardens too as you have given us the great guide on this, thanks for giving us the great blog!